Truthfully, I’m not a big fan of meat. Haven’t been for years. But bacon… salty, crispy, delicious goodness… I have given up meat, but that doesn’t mean that I don’t still like sometimes crave a BLT or a slice with weekend brunch. Also, I live with a small carnivore, and while we’ve had many conversations lately about becoming vegetarians, I don’t feel like it’s right for me to force my beliefs on him. Our compromise is that he is welcome to eat meat when we eat out, and we are going to try more vegetarian meat-like products like bacon or pepperoni. 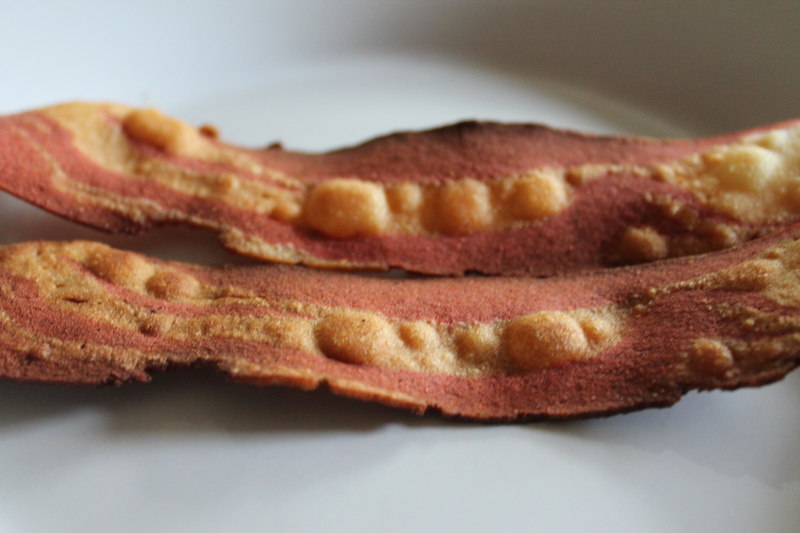 So, here are the results of our Fakin’ Bacon Taste Test. What we thought: Tempeh is a fermented soy, which is supposed to be better for you than plain soy. However, it has a ricey, grainy texture that is very unlike bacon. It also looks more like ground beef that’s been formed into a loaf than like bacon. Michael says “it tastes like your hamburgers, mom.” Which is true, because my “hamburgers” are usually Money’s Mushroom burgers, or the Costco equivalent. What we thought: thin and crispy, this bacon is the closest thing I’ve tasted to it’s pork namesake. This stuff is delicious. I doubt that it would fool a real meat-eater, but it might come close. The drawback of this one is that it’s the only one that isn’t vegan–it uses egg whites in the recipe. It looks the most like real bacon, as well. Start with a smoking hot pan, preferably cast iron. Add about a tablespoon of coconut oil, as it has a really high smoking point, and the bacon won’t really get brown and crispy without it. When the oil is hot, add your bacon, and watch it! Turn after a minute or two. When it’s browned, drain it on paper towels. It crisps up after you take it out of the pan.